2017 Field Recordings, Chenin Blanc, Central Coast, California. Winemaker and nurseryman Andrew Jone’s Field Recordings wines are, according to him a catalog of single vineyard sites, and in some cases multi-site blends, that produce wines with a sense of place, soul and personality, with his keen eye for top vineyards and plants (vines) he has carved out a lovely niche to work from, and especially good is his Chenin Blanc from old vine plantings in the central coast. The 2017 was picked from mainly Jurassic Park, an own rooted site that was originally planted back in 1978 very close to Los Olivos in the Santa Ynez Valley, just north of Santa Barbara, but also with Martin Ranch planted in 1981 and Shell Creek, that has vines that date back to 1972, so it is in many ways a real taste of California Chenin Blanc history in the glass! In fact, Jone’s first wine was his Jurassic Park Chenin and it remains very close to his heart, and with good reason, as it rivals most new generation versions of this grape as well as some of the state’s early Chenin heros like Daniel Gehrs and Chalone. With a nod to the Loire Valley, the spiritual home to Chenin and the areas like Vouvray, Saumur and Savennieres, this dry Chenin is bright, fresh and mineral with just 11.5% natural alcohol, made in a traditional fashion. The 2017 Central Coast old vines Chenin Blanc by Field Recordings, known as their Vieilles Vignes Cuvee, is bright and wonderfully peachy with a lovely waxy texture with good acidity, subtle mineral tones and a crisply dry, but honeyed finish. 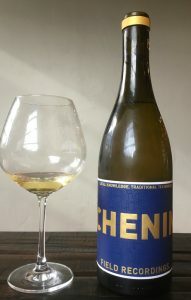 This yellowy/gold pale Chenin adds melon, citrus and white flowers with air as well as gaining a touch of dried ginger, earth, verbena and wet stones in a finely tuned old vine wine that impresses for it’s finesse and expressive varietal character, better yet, it should age gracefully too.